If there existed a competition for the most sensitive and touchy subject in the history of K-Pop, the “revelation of idols’ secret relationship” would kill all. We all know the drill – a news outlet reports a relationship, agencies check with the artists, they confirm the news, and then comes an apology letter to fans, hoping to get their approvals and the magical ending to the whole chaos. When I put it like that, it makes it seem like K-fans are these possessive, overprotective mothers who infringe on their idol’s (or idles, meaning “children” in Korean – sorry, I had to) “right as a human being” and “natural instinct” to have feelings for someone. And believe me, I used to think like that, too. However, as time went on, I couldn’t help but to notice a slight change in the attitude of K-fans when it comes to accepting their idol’s relationship. What’s more interesting is that I have also noticed a change in the attitude of idols, when coming out with a relationship. 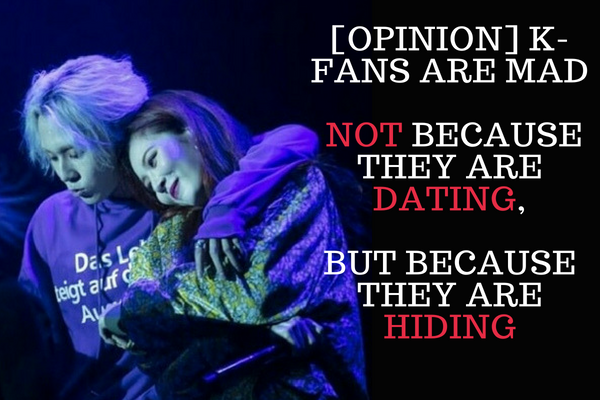 Then, I realized that K-fans are not mad because idols are dating; they are mad because they are hiding. Back in the days of H.O.T and Sechs Kies, it was common that fans felt a certain romantic pull from their idols, and most of them pretended like they were in a personal relationship with the artists. The fans used to look up to the singers and “worship” them, hence the use of the word “idol,” and acted like their guardian angels the singers never asked for. With that being said, it was simply outrageous that idols would ever engage in a romantic relationship with someone else other than fans, let alone go public with it. However, the culture of K-Pop has gotten more sophisticated that it is no longer a vertical relationship between a star and a fan. A mutual respect exists between them because they know they can each benefit from one another. Like friends with (a different kind of) benefit. I even dare say that the artists probably benefit more from their fans because without them, exactly where are they going to find people to vote for them in awards/music shows and buy their albums, ensuring the stable income and extended career? Nowadays, K-Fans are aware that idols are just a group of kids who can’t fight the natural urge to have feelings for someone. We are all humans – we all feel the same emotions. More importantly, they also understand that they don’t actually have the rights to tell their idols what they can and cannot do. While fans don’t necessarily own the idols, they still somewhat have the right to say what they would like to see and not see from them. In other words, fans are just a nice way to say consumers, who have the right to demand things. Idols, as suppliers, need to realize the needs of the consumers, fulfill, and encourage further consumption. First of all, one of the biggest criticisms that K-fans receive is that they tend to think the idols are their boyfriends. They have become possessive and obsessed, putting their noses where they don’t belong. However, need I remind you that it was the companies who laid out the whole boyfriend-girlfriend structure between fans and idols in the beginning? The companies have encouraged the fans to feel this special connection, in order to prevent them from stanning multiple groups. It’s like being in a relationship that you can’t date anyone else. They set up this certain structure, release dating apps and “eye contact” videos to win fans over, then years later, they suddenly demand fans have mercy and see them as ordinary human beings? Whether they like it or not, this imaginary relationship was a part of the deal and what fans, as consumers, have paid for. And idols knew exactly what they got themselves into, when they handed over the control of their image to the management, including restrictions on romantic relationships. Furthermore, in South Korea, the majority of fandom culture is composed of teenagers. And like I’ve said before, the people in the youth community of South Korea don’t get many opportunities to make their own decision. They walk the path already planned and polished by their parents, always craving for freedom and a fancier life. Ultimately, they have found the fancy life from the idols – people who are the same ages as they, yet live in a completely different world. These fans see idols like their “surrogate mothers,” who live out their dream life for them. This is the reason why they consume the idol/k-pop culture, so that they fulfill personal satisfaction through them. Idols sell more than just music. In addition to music, they also sell image, visual, and performance. And fans have this certain “image” they would like to see from their idols, which they cannot quite have in their ordinary lives. In return for their demands, they don’t hold back their wallets. It’s a relationship that creates great synergy – something that allowed BTS to emerge into the international music industry, proudly representing the culture of South Korea. So, exactly what am I suggesting here? I would like to suggest that idols keep their personal life separate from their professional life. Fans know your dating life is not something they can control. However, you still have to respect that fans do not want to see you with your girlfriend/boyfriend in front of them, especially not on stage. Right now, I would like to mention HyunA and PENTAGON’S E’Dawn, who recently admitted their relationship, only to put the future of Triple H in jeopardy regardless of what their original intention was. The reason why this couple received an unusual amount of backlash from the fans is not because they were dating, but because they were sneaking around. According to HyunA, the couple has been dating for over two years, even before the creation of Triple H. We all understand why they had to hide their relationship at first, PENTAGON was still a rookie group back then – a newborn baby who needs the love and attention of a mother. However, was it really necessary that they create a coed unit that consists of two real-life lovers, when they knew exactly how fans would feel when they found out the truth? If they wanted to be “honest” and “confident” like HyunA said they wanted to, they should have come clean with their relationship from the beginning, or hide it until the end. Instead, they played with the fans by saying they have never dated anyone, and writing a song about their secret relationship. From a fan’s point of view, it’s like we have paid for the two to go on dates not only privately, but also publicly on camera. Once you blur the boundary between your personal life and professional life by bringing private feelings into a workplace, you can’t be mad that other people no longer trust you, professionally. Just like we can’t trust E’Dawn and HyunA anymore, especially with the actions they have shown after the dating news broke out. 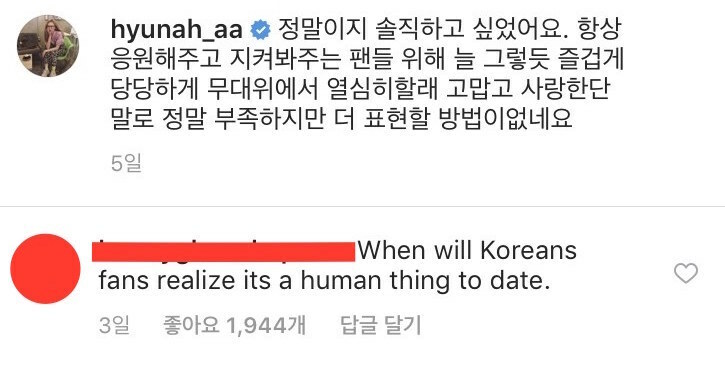 Korean fans are aware it’s a human thing to date. Just be a professional and keep your pants on in front of the cameras.